Today Susie and I rented ATVs with our new Australian friend Amy! We drove all around the island, up and down the hills. We went through beautiful valleys with vineyards and there are donkeys and goats everywhere! I highly recommend renting an ATV while you are in Greece. They range from 15 - 18 euro per ATV including helmets but the price of gas is extra. Look for a place that lets you rent it for 24 hours to maximize your time on it. The two of us where driving all day and only had to fill up at the beginning of our trip! Beautiful view from the top of the mountain above the Farout beach! 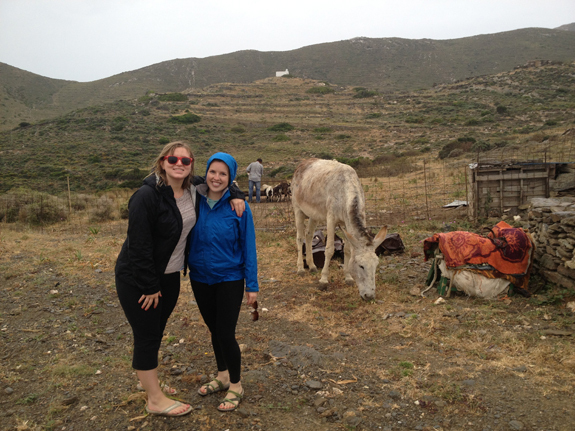 On our way to Homer's tomb, there was a little farm with goats and donkeys! There were no building anywhere around and the farmer was there feeding them when we drove by! Here I am in front of Homer's tomb! He was a famous Greek poet who wrote The Odyssey and The Iliad. Legend has it that he was buried here but there is no proof. Wonder where he was burried? The long ride up and over the mountain to the other side of the island was well worth it for this beautiful view! We ran into rush hour in the countryside! It's hard to see at first but if you look closely there were over a hundred goats wondering around the mountain!